This chapter chronicles the development and spread of corrugation through analyses of attribute-level data on utility ware pottery from the Mesa Verde region and a synthesis of published and unpublished information on pottery from across the Southwest. This chronicle begins with a detailed presentation of data relating to the development of corrugation in the Mesa Verde region. In this section, I examine evidence for how the early plain utility ware vessels were manufactured, and the nature and timing of the various technological innovations that led to the development of full-body corrugated vessels. This evidence is drawn mainly from my analyses of gray ware pottery in the six assemblages selected from the Mesa Verde region described in the previous chapter, and supplemented with published data when available and appropriate. Following this detailed history, I compile published information on the spread of corrugation technologies across the northern Southwest. Given the general lack of attribute-level data on utility ware pottery in the published literature, I am forced to rely on type descriptions and frequencies to document the spread of corrugation. Consequently, I focus on major transitions, including the first appearance of exposed coils and the introduction of indented corrugation, that are reasonably well documented by typological distinctions and data available in published form. The transition from scraped plain to fully corrugated vessels involved several changes in how the pottery vessels were constructed prior to firing. Observations of ancient fragments from these different kinds of vessels can provide abundant evidence on the forming or construction techniques employed, and a wide range of techniques has been developed to extract this information (e.g., Carr 1990; Feathers 1990; Rice 1987; Rye 1981; Shepard 1976; Vandiver 1988). In the analyses I performed for this study, I relied on macroscopic and low power microscopic observations of surface features, core structure, and fracture patterns to document the techniques used to construct plain and corrugated gray ware vessels in the Mesa Verde region. Some of these attributes were measurable on all sherds, while others were applicable only to corrugated sherds with exposed coils. For all sherds, I recorded five categorical attributes that provide data on the forming techniques employed: sherd fracture pattern, surface forming and finishing traces, surface applications, and core structure. The fracture morphology of sherds was recorded as random, cubic, stepped, or indeterminate. Cubic and stepped fractures display parallel fracture edges in the horizontal plane of the vessel resulting from the fractures occurring along the joins between coils or other horizontally applied construction elements, and thus can be indicative of the use of coils in manufacture. Random fractures show no preferred edge orientation and result from either a lack of weaker coil junctions that produce preferred breakage planes, or the breakage of pots into pieces that are smaller that the coils used to construct the vessel. The states used to record surface forming and finishing traces include none, indented, incised, scraped, paddled, pinched, wiped, polished, smeared, combination, other, and indeterminate. Surface application states include none, slipped, painted, slipped and painted, other, and indeterminate. Each of the surface attributes was recorded for both interior and exterior surfaces. Finally, the structure of the core exposed in a freshly broken edge of the sherd was recorded as homogeneous, blocky, laminar, irregular, or other. The quality and processing of the raw materials and the nature of pressures applied during manufacture contribute to the formation of different core structures. Finally, I also recorded the likely form, or shape of the vessel from which each sherd came. Vessel form categories include wide-mouth jar, narrow-mouth jar, seed jar, indeterminate jar, bowl, ladle, other, and indeterminate form. The definitions and identification criteria for each form category are discussed at length in Chapter 6. For sherds with exposed or unobliterated coils on the exterior surface, I recorded five additional attributes indicative of the forming techniques employed. These attributes include coil application, coil junction depth, exposed coil height, coil surface indentation frequency, and the percent overlap between adjacent coils. Coil application technique was recorded as either filleted (non-overlapping), overlapping, or indeterminate. For overlapped coils, coil junction depth refers to the distance in millimeters between the crest of a coil and the point at which it joins the coil below (Figure 6). I measured this attribute by resting the base of the arm of a dial caliper against the crest of a coil and opening the caliper until the projecting rod came in contact with the surface of the coil below. For filleted coils, this measurement is the depth of the incision or crease between exposed coils. In both cases, an average of several measurements was recorded. Exposed coil height is the average distance in millimeters between the crests or junctions of adjacent coils, whichever is most convenient to measure on a given piece (Figure 6). To obtain an average, I measured the distance across as many coil crests as were present on a given sherd and divided this distance by the number of coils over which the measurement was taken. Coil surface indentation frequency refers to the average distance in millimeters between adjacent indentations visible on the surface of exposed coils (Figure 6). This was determined by measuring the distance between the same location on the indentations (crest of ridge, bottom of indent, etc.) across as many indentations as possible and dividing this distance by the number of indentations across which the measurement was taken. Percent coil overlap is the percent of one coil that is overlapped or covered by the next coil applied above it (Figure 6). To measure this attribute, the boundaries between adjacent coils must be visible in an edge of the sherd. If coil boundaries were visible, I divided the distance from the coil junction at the inside surface of the vessel wall to the end of the overlapping coil by the distance from the same inside surface point to the end of the coil being overlapped. The percent overlap of filleted coils was recorded as 0 even though the base of filleted coils often drooped slightly over the top of the coil below. Figure 6. Diagram of metric attributes recorded on exposed coils. To obtain a general overview of the change from plain to corrugated vessels, we can track the occurrence of exposed coils in the six gray ware assemblages. Figure 7 shows the abundance, by weight, of sherds displaying exposed coils relative to the weight of plain sherds in each assemblage. Initially, in the late eighth and early ninth centuries AD, plain pottery dominated utility ware assemblages. The relative abundance of pottery with exposed coils increased gradually, reaching just over 10 percent by the late ninth century, nearly 40 percent by the mid tenth century, and then accounting for almost all gray ware pottery by the early to mid eleventh century. This increase in the amount of pottery displaying exposed coils derives from both a change in the relative abundance of gray ware vessels with exposed coils and an increase in the amount of surface area per vessel covered with exposed coils. Table 1 indicates that exposed coils occur almost exclusively on wide-mouth jars, and the occurrence of exposed coils on wide-mouth jars increased rapidly during the ninth century. The proportion of wide-mouth jars in relation to other vessel forms in gray ware assemblages also increased during this time (see Chapter 6 for a discussion of changes in utility ware vessel forms through time). Table 2 presents the relative frequency of exposed coils on different vessel parts, and shows a gradual extension of exposed coils down the vessel body through time. Figure 7. Relative abundance, by weight, of sherds with exposed coils in the six utility ware assemblages from the Mesa Verde region. Table 1. Abundance, by weight, of pottery with exposed coils on different vessel forms in the six utility ware assemblages from the Mesa Verde region. 1Includes total grams of pottery identified to a particular vessel form in each assemblage. 2Percentage calculations for vessel form classes are based on the total amount of pottery identified to each form class in each assemblage. Total percentages are based on the total amount of pottery assigned to any vessel form class. Table 2. Abundance, by weight, of pottery with exposed coils on different vessel parts in the six utility ware assemblages from the Mesa Verde region. 1Includes total weight of pottery identified to this vessel part category in each assemblage. 2Percentages based on weight of pottery with exposed coils calculated separately within each vessel part category for each assemblage. In presenting a more detailed account of the development of corrugation, I begin with a presentation of the evidence for how the early plain vessels and the plain portions of later vessels were formed. This is followed by a discussion of each of the innovations in forming techniques that led to corrugation. These innovations include changes in the techniques of coil application, and the manipulation of coils during and after their attachment to the vessel body. Archaeologists commonly assume that plain-surfaced pottery in the Mesa Verde region was constructed from coils, which were then scraped to form the vessel ( Blinman and Wilson 1988b; Breternitz et al. 1974). However, very little empirical evidence has been brought to bear on the issue. Examination of broken vertical edges of plain surface pottery in the six gray ware assemblages revealed several cases in which the join between adjacent construction elements (coils or slabs) was clearly visible from the orientation of large particles and pores. For the earlier assemblages, in which plain surface pottery is much more common, all observed joins or junctions were filleted or stacked rather than overlapping. However, in no cases were both lower and upper edges of a construction element visible in a single sherd. At least one sherd from 5MT4671 (Periman Hamlet) preserves slightly over 2 cm of vessel wall above a coil/slab junction. This suggests that, at least in the earlier pottery, construction elements were relatively large, and either pinched up or applied as broad, flattened segments. Fracture pattern data also suggest that construction elements, whether considered slabs or coils, were relatively wide during the eighth and ninth centuries AD, and became smaller after that time. Table 3 shows the frequencies of random and non-random (cubic and stepped) fractures and the association between sherd size (as measured by maximum sherd length) and fracture pattern in the six gray ware assemblages. The high proportion of random fractures and significant association between fracture pattern and sherd size in the earliest three assemblages (5MT2193, 5MT4671, and 5MT8368) suggest that most of the sherds in these assemblages are smaller than the size of the coil or slab from which the vessel wall was constructed. The increase in non-random fractures and breakdown in the association between sherd size and fracture pattern in the tenth and eleventh centuries without a significant increase in sherd size indicates a smaller size of the coil from which the vessel was constructed. Table 3. Association between fracture pattern and sherd size for plain-surfaced pottery in the six utility ware assemblages from the Mesa Verde region. Nonrandom fracture pattern includes cubic and stepped fractures. N equals count of sherds. Surface features and core structure can provide information on how the vessel wall was manipulated after primary construction elements were applied. Tables 4 and 5 show the frequencies of surface features and core structure respectively for the six gray ware assemblages. Sherds displaying scrape marks on both surfaces dominate plain-surfaced pottery in all assemblages. Irregular core structures dominate all assemblages except Gnatsville (5MT1786), while laminated structures, which might result from forming with a paddle, are rare in all assemblages. The variation that does exist in core structure among assemblages shows no clear temporal trend that might be related to the development of corrugation. My experience in pottery replication suggests that the greater occurrence of blocky and homogeneous core structures in the Gnatsville assemblage may be due to differences in composition or preparation of the clay. However, more focused and controlled experiments are necessary to further clarify the causes of these differences in core structure. Table 4. Abundance of different surface forming marks on plain-surfaced utility ware pottery in the six assemblages from the Mesa Verde region. Table 5. Abundance of different core structures in plain-surfaced pottery in the six utility ware assemblages from the Mesa Verde region. The manufacture techniques used for vessels or portions of vessels with exposed coils vary in the way coils were applied, the height of the exposed coil, the depth of the exposed junction between coils, and the manipulation of the exposed coil surface during and after coil application. In the analysis of the six gray ware assemblages, I measured several attributes designed to document variation and change in these four aspects of exposed coils. In this presentation of the results of these analyses, I first discuss nature and temporal distribution of each of the dimensions of variation separately, and then consider patterns in their covariation through time. Exposed coils were applied by either filleting or overlapping. In filleting, coils are stacked on top of one-another with no significant overlap between adjacent coils. In overlapping, coils are applied at an angle so that the upper coil covers or overlaps some of the surface of the coil below. These coils, whether filleted or overlapped, can be applied either in concentric rings or in a spiral fashion simulating a single continuous coil to build up the vessel wall. Previous studies of complete vessels have shown that early exposed coils were applied using the concentric ring technique while later corrugated vessels were built with the spiral technique ( Breternitz et al. 1974; Kidder and Shepard 1936; Morris 1939:186). The nature of the transition between these two techniques has never been adequately documented. However, because it is extremely difficult to discern concentric and spiral applications from vessel fragments, I was not able to document it in my analyses and will not discuss it further here. Table 6 shows the abundance of filleted and overlapped coils in the six assemblages. The few fragments with exposed coils in the earliest assemblage are all filleted. Overlapped coils make up slightly less than 30 percent of assemblages dating to the ninth century. Overlapped exposed coils increased to almost 75 percent in the tenth century, and reached 100 percent in the eleventh century. Among overlapped coils, the amount of overlap between adjacent coils also increased through time. In the ninth century, most coils had less than 50 percent overlap while in the eleventh century, most coils overlapped more than 50 percent (Figure 8). Not only did overlapping replace filleting as a coil application technique, but the degree of overlapping itself became more pronounced through time. Table 6. Abundance of filleted and overlapped exposed coils in the six utility ware assemblages from the Mesa Verde region. Figure 8. Box plot of the percentage of overlap between adjacent exposed coils in the six utility ware assemblages from the Mesa Verde region (N = grams of pottery). Variation and change in the visible height of exposed coils follow a similar temporal pattern to coil application (Figure 9). During the eighth and ninth centuries, exposed coils were usually more than 10 mm high, although displaying considerable variation. In the tenth century, coil height decreased abruptly with most coils substantially less than 10 mm in height. This pattern of narrow exposed coils persisted into the eleventh century as the median and variation in coil height continued to decrease, although more gradually. 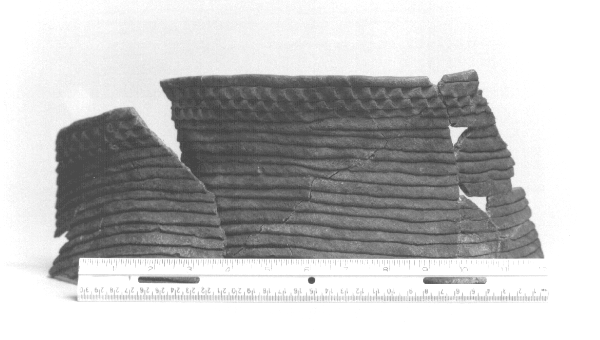 A trend toward decreased exposed coil height has also been well documented for neck-banded pottery analyzed as part of the Dolores Archaeological Program ( Blinman 1984). The decrease in coil height during the tenth century occurred in two ways. Increased use and degree of overlapped coil application resulted in less of each coil remaining exposed on the surface, and some filleted pottery was made with smaller coils than were used earlier. These small filleted coils disappear in the eleventh century, and increased overlapping accounts for the continued decrease in coil height during that time. Figure 9. Box plot of the height of exposed coils in the six utility ware assemblages from the Mesa Verde region (N = grams of pottery). The junction depth measurement was used to record two different attributes. For filleted coil pottery, junction depth refers to the depth of the depressed line or zone marking the join between two coils below the maximum height of the adjacent coils. For overlapped coil pottery, junction depth measures the degree of clapboarding, or the distance between the highest point on the ridge of a coil and the surface of the coil that it overlaps. Figure 10 shows the median and variation in junction depth for filleted and overlapped coils in the six assemblages. Both the filleted junction depth and degree of clapboarding increased through time. Although, the median degree of clapboarding in the Gnatsville (5MT1786) assemblage is less some earlier assemblages, it is difficult to determine if this is representative of a general trend in early eleventh century pottery, or a consequence of sampling error. For filleted coils, the increase in junction depth probably came mainly from the greater use through time of narrow, rounded coils in place of broad, flattened coils, and thus, creating a deeper depression between adjacent coils. The more pronounced clapboarding through time, particularly in the latest assemblage, probably reflect the use of deeper indentations which would push up the surrounding clay and result in a greater distance between the ridge peak and the coil below. Figure 10. Box plot of coil junction depth for filleted and overlapped exposed coils in the six utility ware assemblages from the Mesa Verde region. Table 7 presents the data on the different ways in which the surface of exposed coils were manipulated in the six assemblages. In the assemblages dating to the eighth and ninth centuries, most of the coil surfaces were pinched, scraped, or wiped probably during application. In the late ninth century, tool incising along coil joins appeared for the first time, and, in the tenth century, indenting of coil surfaces began. In both cases, these forms of coil manipulation occurred first on relatively few pieces. Most exposed coils were left unmanipulated through the middle of the tenth century. By the early eleventh century, indentations occurred on almost 90 percent of exposed coils. Figure 11 shows that the spacing between indents was erratic and relatively wide during the tenth century, but became more closely and consistently spaced in the eleventh century. In addition, indentations occur mostly just below the rim on the last three or four coils applied to the vessel during the tenth century (Figure 12), and thus, probably began as a decorative elaboration. Table 7. Abundance of different manipulations of exposed coil surfaces in the six utility ware assemblages from the Mesa Verde region. Figure 11. The spacing of indentations on exposed coils in the latest three utility ware assemblages from the Mesa Verde region. Figure 12. An example of early indenting on neck-banded pottery from the Mesa Verde region (Site 5MT4475, RC1, Anasazi Heritage Center). To examine the relationships among the different exposed coil dimensions, I created a paradigmatic classification using selected attributes of three of the dimensions-coil application (filleted, overlapped <50 percent, or overlapped >50 percent), coil height (>10mm or <10mm), and indentation (present or absent). Of the 12 possible classes defined by this paradigm, only nine classes have members identified among the sherds in the six gray ware assemblages. Figure 13 shows the changes through time in the relative abundance (quantified by weight) of pottery in the nine different exposed coil classes. A majority of the exposed coils manufactured during the eighth and ninth centuries consisted of wide filleted coils without indentations. During the ninth century, however, narrower filleted coils and wide coils with slight overlap began to be manufactured in small to moderate amounts. In the tenth century, variation in the construction of exposed coils reached its zenith, and the most abundant class shifted to narrow, substantially overlapped coils without indentations. Although no single variant accounts for more the 40 percent of the assemblage from the tenth century, three different varieties of narrow, unindented coils make up more than 80 percent of exposed coils. By at least the early eleventh century, one of the variants, narrow, substantially overlapped, and indented coils, which appeared in low frequencies for the first time in the tenth century, almost completely replaced all others. The abrupt increase in this class of exposed coils marks the adoption of indented corrugation. This also coincides with the spread of exposed coils over the entire exterior surface of most gray ware vessels. These data show conclusively that there was historical continuity in the development from vessels with entirely plain exterior surfaces, through various forms of neck banding, to full- body indented corrugation. In addition, the data document the gradual accumulation of innovations in the manufacture of exposed coils through the tenth century followed by the nearly complete fixation of one combination of these innovations, indented corrugation, by the early eleventh century in the Mesa Verde region. Figure 13. The relative abundance, by weight, of pottery assigned to different classes of exposed coils in the six utility ware assemblages from the Mesa Verde region. Class E is represented by only 6 g of pottery from 5MT3868. Error bars = 90% confidence intervals. Class A in the assemblage from 5MT2193 is 100%. Documenting the spread of corrugation technology on the basis of published information is a formidable undertaking. Given that one must rely, for the most part, on pottery type data from diverse regions of the Southwest, two hurdles present themselves. The first has to do with dating. Ideally, one reconstructs the spread of corrugation based on independent, absolute dates of the earliest appearance of a particular corrugation type, or technique, in different areas of the Southwest. However, many areas of the Southwest lack adequately dated pottery assemblages that span the entire sequence of changes. Consequently, the beginning and ending dates for many pottery types are based on cross dating with other regions. While often useful for general chronological purposes, cross dating can introduce problems when one is trying to determine if a particular kind of pottery is slightly earlier or later in one region than another. The second hurdle involves the use of numerous different typological schemes across the Southwest. Pottery type names and descriptions can vary considerable from one region to another making it difficult, in some cases, to be sure that one is dealing with the same technology. Utility wares have not generally been accorded the kind of intense scrutiny often given to painted pottery in the Southwest. This lack of attention means that many dating and typological discrepancies and subtleties have gone unexamined or undocumented. As a result of these issues, the reconstruction of the spread of corrugation across the Southwest I present here should be considered tentative, and subject to alteration as new data come to light and more thorough evaluations of existing data are conducted. The earliest evidence of any type of corrugation, or exposed coil technology in the American Southwest is during the middle to late seventh century AD in the southern Mogollon or Mimbres region of New Mexico ( LeBlanc 1982; Wasley 1960). This pottery, referred to as Alma Neckbanded, is very similar to the earliest pottery with exposed coils in the Mesa Verde region and elsewhere in the northern Southwest. The unobliterated coils are relatively wide and non-overlapping, and they are restricted to the neck region of jars ( Haury 1936; Hawley 1950). The main difference between Alma Neckbanded and the early neck banded pottery of the northern Southwest is that the Alma Neckbanded is a brown ware pottery made from iron-rich clay and fired in an oxidizing atmosphere. The northern neck-banded pottery, referred to as Kana'a or, in the Mesa Verde region, Moccasin Gray, is a gray ware fired in a reducing atmosphere. The Alma Neckbanded technology, if not the pottery itself, spread north and west, appearing in the Quemado area of west-central New Mexico ( Mills 1987; Wasley 1959) and the Forestdale Valley of east-central Arizona (Haury 1940a, 1940b) during the early part of the eighth century (Figure 14). In the Quemado area, both Alma brown neck banded and Kana'a gray neck banded pottery occur, but the Alma type appears earlier than the Kana'a type. The Kana'a style gray neck banding technology appears to have spread north across the Zuni and Puerco (of the west) Rivers, through the Hopi and Kayenta areas west of the Chuska Mountains, into the Mesa Verde and Gobernador regions to the north and east, and west into the Flagstaff, Grand Canyon and Virgin River areas (Figure 14). In each of these regions, with the possible exception of the Grand Canyon and Virgin River areas, this earliest form of corrugation appears to be reasonably well dated to the late eighth or early ninth centuries ( Breternitz 1966; Breternitz et al. 1974; Colton and Hargrave 1937; Dittert et al. 1961; Eddy 1966; Hall 1944; Harlan 1962; Hays-Gilpin and van Hartesveldt 1999; Layhe 1984; Plog 1984). The presence of Mogollon-like brown wares in early ceramic assemblages from the Colorado Plateau ( Wilson and Blinman 1994), and greater than expected population growth in some parts of the Plateau during the eighth century ( Schlanger 1986) suggest that migrations of people north out of the Mogollon region may have played an important role in the rapid spread of Kana'a style neck banding. However, the evidence for migration is not yet conclusive ( Wilson 1988a). Figure 14. Map showing a reconstruction of the spread of early neck banding in the American Southwest. After a delay of 50 to 100 years, Kana'a style neck banding spread into the southern San Juan Basin on the east side of the Chuska Mountains, and then into the Rio Puerco (of the east), Jemez and middle Rio Grande valleys (Figure 14). Recently reported evidence from the southern Chuska Valley ( Freuden 1996; Loebig 1996; Reed et al. 1996; Stirniman and Yost 1996) and Chaco Canyon ( Toll and McKenna 1997) date the earliest appearance of neck-banded pottery to the late ninth century. Although the first neck-banding is not as well dated in the Puerco/Rio Grande area, Kana'a style pottery does post date AD 800, and probably appeared closer to the turn of the tenth century ( Durand and Hurst 1991; Hurst 1991; McNutt 1969; C. Dean Wilson, personal communication). It took even longer for neck banding to reach the Taos and Gallina areas of northern New Mexico where the technology appears to post date AD 1000, and never became a significant part of the utility ware tradition ( Hibben 1949; Mera 1938; Wilson 1995; Wilson and Lakatos 1997). The delayed appearance of neck-banding in the southern San Juan basin and Rio Grande areas suggests that these areas were isolated from the contacts, either migration or diffusion, that led to the initial spread of exposed coil technology into the northern Southwest. The delayed appearance of certain styles of painted pottery (e.g., Reed et al. 1996) supports the notion that these areas were isolated from interaction with other areas of the Southwest, rather than some other mechanism inhibiting the movement of utility ware technologies alone. This isolation broke down in the late ninth century when a drought and prolonged period of short growing seasons ( Dean 1988; Petersen 1988) resulted in substantial population declines in the Mesa Verde region and elsewhere in the northern Southwest ( Berry 1982; Nichols and Smiley 1984; Schlanger 1986; Wilshusen and Schlanger 1993; Wilshusen and Varien 1996). At the same time, population increased in the southern San Juan basin and Rio Grande areas, probably as a result of immigration from the areas to the north being partly or wholly abandoned ( Baker and Durand 1991; Hayes 1981; Kearns 1997; McNutt 1969; Wilshusen 1995; Windes 1987). Consequently, it appears that a substantial southward migration out of the upper San Juan basin during the late eighth and early ninth centuries may account for the introduction of neck banding into the southern San Juan and Rio Grande areas. Despite the variable introduction of Kana'a style neck banding into different parts of the Southwest, the development of narrow filleted and overlapping coils and some form of indentation appears to have occurred in several places at more or less the same time during the late ninth to mid tenth centuries. However, the dating of the individual innovations is extremely poor. One of the reasons for the poor dating is that the current typologies tend to lump all of these features into a single transitional utility ware type. By combining these features into single types with long temporal spans, it makes it extremely difficult to date the introduction of any one innovation as I did earlier in this chapter for the Mesa Verde region. The most common of these types include Medicine Gray west of the Chuska Mountains ( Colton and Hargrave 1937; Colton 1955), Mancos Gray in the northern San Juan region ( Breternitz et al. 1974), Tohatchi Banded in the southern San Juan basin area ( Wendorf et al. 1956; Windes 1977; Reed et al. 1996), and Three Circles Neck Corrugated in the eastern Mogollon region ( Haury 1936; Hawley 1950). Based on current evidence, it appears that these innovations (narrow overlapped and filleted coils, and indenting) may have occurred first in the eastern Mogollon region, but this is by no means a secure conclusion. The development of substantially overlapped and systematically indented pottery (indented corrugation), and the use of these techniques over the entire exterior vessel surface are more easily dated because this combination of attributes has tended to be distinguished by specific pottery types. The regular use of indented corrugation may have occurred first during the middle of the tenth century, in and around the Chaco Canyon and Chuska Valley areas of the southern San Juan basin. This dating is based on unusually high frequencies neck corrugation (overlapped and indented coils restricted to the neck portion of jars) in comparison to other areas of the northern Southwest, and a firm association of neck and full-body corrugation with Red Mesa Black-on-White, a painted pottery style manufactured during the tenth century at Chaco Canyon ( McKenna and Toll 1984; Toll and McKenna 1997; Windes 1977). The regular, and often exclusive, use of full-body indented corrugation on utility wares spread rapidly across most of the Colorado Plateau from the likely center of development in the southern San Juan basin (Figure 15). Full-body corrugation rapidly replaced neck banding between 1030 and 1060 AD from the Virgin River region on the west to the Rio Puerco (of the east) on the east, and from the Mesa Verde region in the north to the Rio Puerco (of the west) and San Jose River in the south ( Breternitz 1966; Breternitz et al. 1974; Hays-Gilpin and van Hartesveldt 1995; Hurst 1991; Larson and Michaelson 1990; McKenna and Toll 1984; Plog and Hantman 1986; Reed et al. 1996; Toll and McKenna 1997). Indented corrugation on a variety of vessel forms also appears for the first time during the latter half of the eleventh century in the Fremont area of southern and western Utah and eastern Nevada without any clear neck banded antecedent ( Dodd 1982; James 1986; Lohse 1981; Madson 1970, 1979, 1986; Steward 1936). Indented corrugation was adopted slightly later, during the middle of the twelfth century, in the far southern Colorado Plateau, the eastern and western Mogollon regions, the Sinagua region, and the middle Rio Grande Valley, and later still, during the early thirteenth century, in the Taos area indicating a slower south and eastward spread of the technology ( Anyon and LeBlanc 1984; Barter 1957; Brunson 1985; Crown 1990; Doyel 1978; McGimsey 1980; McNutt 1969; Mills 1987; Rinaldo and Bluhm 1956; Stark 1995a; Tuggle 1982; Wetherington 1968; Wilson 1995; Wilson and Lakatos 1997). In the Rio Grande, Mogollon, and southern Sinagua areas, full-body corrugation existed side-by-side and in combination with a wide variety of other kinds of utility ware technologies including neck banded, incised, punched, plain, and smudged vessels. In the western Mogollon/Sinagua region, the appearance of indented corrugation during the eleventh century marks the first use of corrugation techniques in this area (Stark 1995a). Although some corrugation occurs in Classic Period (post AD 1150) Hohokam settlements in the Sonoran Desert of southern Arizona, the distributions are spotty, and frequencies tend to be quite low in comparison to other kinds of utility wares (e.g., Jewett 1986; Wood and McAllister 1982). Migration, trade, and large-scale socio-political integration or affiliation may have been involved in the rapid spread of full-body corrugation. 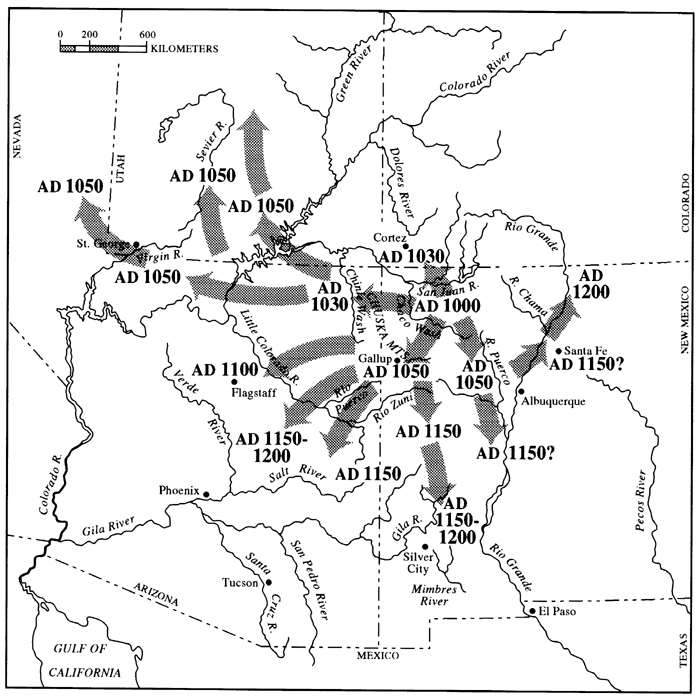 Improved climatic conditions together with the adoption of new, intensified agricultural practices in the late tenth through the middle twelfth centuries, resulted in unprecedented population growth and territorial expansion by Puebloan agriculturalists in the American Southwest ( Dean 1996; Dean et al. 1994; Dean et al. 1985; Gumerman and Gell-Mann 1994). This demographic surge is known as the Pueblo II expansion. The eleventh century demographic upturn also coincided with the possible development of the first large-scale economic, social, political and ideological integration in the Colorado Plateau area, commonly referred to as the "Chacoan regional system" ( Crown and Judge 1991; LeBlanc 1989; Lekson et al. 1988). Although degree of integration in the Chacoan regional system may be overdrawn ( Durand 1992), the generally accepted boundaries of this entity roughly correspond with the area of rapid spread of full-body corrugation with the exception of the far western and northern extensions. The eleventh century also provides the first secure evidence for specialized production and long-distance trade of utility ware pottery. In the early eleventh century, corrugated pots produced along the eastern flanks of the Chuska Mountains constitute half of all culinary pottery recovered from settlements in Chaco Canyon located over 90 km to the east ( Toll 1991). This level of movement of culinary pottery into Chaco Canyon represents a dramatic increase over earlier periods. Figure 15. Map showing a reconstruction of the spread of full-body, indented corrugation in the American Southwest. Evidence from the Mesa Verde region suggests that the population expansion and increased trade of culinary pottery during the late tenth and early eleventh centuries played a role in the relatively rapid spread and adoption of full-body corrugation in that area. 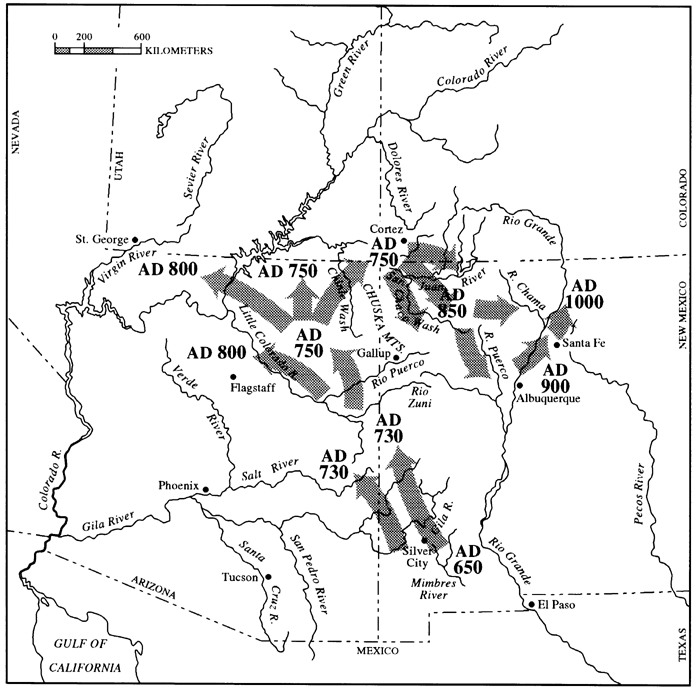 Although the late ninth or very early tenth centuries saw the abandonment of most of the Dolores River valley ( Blinman 1994; Kane 1986), some sites show signs of reoccupation by small groups in the late tenth century. At McPhee Village, one of the large ninth century settlement clusters in the Dolores valley, two of the settlements (McPhee Pueblo and nearby Masa Negra Pueblo) were reoccupied in the middle to late tenth century by approximately 13 households ( Brisbin et al. 1988; Kuckelman 1988b). Indented corrugated fragments from vessel bodies were recovered from these late occupations at both settlements. In addition, these late tenth century ceramic assemblages contain unusually high proportions of pottery manufactured in the Chuska and Cibola areas of the southern San Juan basin ( Blinman and Wilson 1988a). Whether this increase in nonlocal pottery resulted from immigration of people from the southern San Juan, or increased trade between the two areas has not been determined. However, regardless of the mechanisms involved, these data indicate increased interaction of some sort with the potential of transmitting the new trait of full-body corrugation. In the Rio Grande areas, however, evidence suggests a more complex set of mechanisms involved in the spread of corrugation. At least some of the corrugated pottery made in the Rio Grande valley was manufactured differently from corrugated pottery found elsewhere. Although the general appearance is similar, the forming techniques differed in an unusual way. Specifically, rather than applying and overlapping coils so that they slope down and away from the vessel as was done in the Mesa Verde region and elsewhere in the Southwest, some potters in the Rio Grande area applied their coils so that they overlap toward the inside of the vessel (Eric Blinman, personal communication). One possible reason for this difference is that the spread of corrugation into the Rio Grande involved the movement of pottery rather than the specific knowledge or instructions on how to make corrugated vessels. In evolutionary terms, it was the pottery that was the replicator in some cases, rather than particular behaviors or ideas. In addition, recent research on eleventh and twelfth century Valdez Phase sites in the Taos area indicates that, although plain pottery dominates utility ware assemblages, a wide variety of corrugation techniques, including Kana'a style neck banding to indented corrugation, occur in very low frequencies (usually less than 1% of utility wares) at these sites ( Wilson 1995). Some of this corrugated pottery appears to have been manufactured locally while others were imported. As noted above, indented corrugation was not a common feature of Taos area pottery until the thirteenth century. However, the designs on Valdez Phase painted pottery are very similar to those used at the same time farther south in the Rio Grande valley and on the Colorado Plateau to the west ( Wilson 1995). These differences in the timing of the spread of painted designs and corrugation techniques indicate that simple migration or diffusion models cannot account for their introduction. Instead, more complex political or social factors may have been involved in the spread of different pottery-making technologies to the Taos area. In the Four Corners area, full-body indented corrugation continued to dominate utility ware assemblages until Pueblo people abandoned the region at the end of the thirteenth century. Indented corrugation also appeared on a small proportion of painted, white ware pottery; most commonly on the exterior of bowls during the eleventh century, and on the necks of narrow-mouth jars (ollas) during the thirteenth century. In the Mogollon areas and the Tonto Basin, corrugation of bowls was much more common than among Pueblo populations living on the Colorado Plateau. Full-body corrugation, in various forms, continued to be manufactured and, in most areas to dominate utility ware assemblages until, at least, the middle of the fifteenth century when Pueblo potters returned to making plain-surface utility vessels ( Anyon and LeBlanc 1984; Gifford and Smith 1978:18; Hays 1991; Kidder and Shepard 1936; Lang 1982). During the more than four hundred years that indented corrugation was used in the manufacture of utility wares, Pueblo society experienced a wide variety of changes including large-scale population movements, regional abandonments, and momentous changes in climate, social organization, and ideology ( Adams 1991; Adler 1996; Dean 1996; Lipe 1989). After the large-scale adoption of full-body corrugation, the techniques used to produce corrugated vessels did not remain static, but continued to vary. Innovations came mainly in the areas of vessel morphology, and the elaboration of patterns created by the placement of indentations and appliques ( Breternitz et al. 1974; Colton 1955; Gifford and Smith 1978). In addition, some plain utility vessels continued to be made throughout the period of dominance by corrugation, with some regions showing more variation than others. On the Colorado Plateau, most of these later plain types, such as Mummy Lake Gray in the Mesa Verde region and Kiet Siel Gray in the Kayenta region, were actually produced by smearing or obliterating corrugations ( Breternitz et al. 1974; Colton 1955 ). In the late fourteenth and early fifteenth centuries, this long-standing, yet sporadically employed, technique of smearing corrugations became much more common and widespread. By the middle to late fifteenth century, pottery with smeared or blind corrugations was eventually replaced by entirely plain vessels ( Kidder and Shepard 1936; Spier 1917). When the Spanish arrived in the Southwest during the sixteenth century, corrugation was not a part of the Pueblo pottery technology they observed.